Two distinctive uppermost Silurian to Lower Devonian radiolarian assemblages, the Pseudospongoprunum tauversi As- semblage and the Futobari solidus-Zadrappolus tenuis Assemblage, occur in new localities of felsic tuffaceous strata in the Hitoegane area of the Hida-gaien terrane of central Japan. The first is characterized by the presence of P. tauversi and diverse inaniguttids, which can be correlated with the well-constrained Pridolian radiolarian zonal fauna defined in west Texas. The second occurs stratigraphically above beds containing the P. tauversi Assemblage and in strata correlative to beds from which a probably Lower Devonian flora has been recovered. These occurrences indicate that the F. solidus-Z. tenuis Assemblage ranges from uppermost Silurian to Lower Devonian. Based on the stratigraphic context for the underlying Pridolian P. tauversi Assemblage, the probably Lower Devonian flora, and the rein- terpretation of the previously dated zircon U/Pb age, the F. solidus-Z. 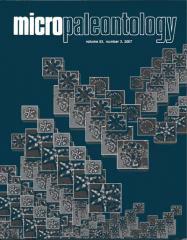 tenuis Assemblage is the first confirmed radiolarian assemblage from the lowermost Devonian. Previous workers have suggested that entactiniid radiolarians became increasingly dominant in the latest Silurian to Early Devonian, but the present study shows that inaniguttids such as Futobari and Zadrappolus were dominant in the early to probably middle Early Devonian. A new inaniguttid species is described: Zadrappolus (?) nudus n. sp.